There are many possibilities with cinema 4 d and turbulence fd, This time we bring you the walkthrough that both asked us , that is the eruption of the volcano in cinema 4d. To make this effect we also use the powerful tool "thinking particles in cinema 4d "
volcano c4d , is a visual effect very popular and fairly simple to do with cinema 4d ,most of the visual companies are always using effects of fire, smoke, air. and are quite common in movies like the Lord of the rings, Harry Potter and movies at the end of the world like volcano . 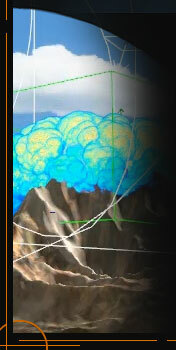 There are many applications of explosion in cinema 4d.